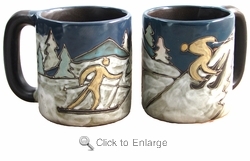 This Mara Stoneware Mug features a skier with snow and mountains in the background. An excellent gift for the outdoorsman who enjoys skiing. We also offer a 12oz square bottom Skier mug at Mara Mug - Skier 12oz.